The Preston Bacon Factory was commercial premises built around 1905. It was owned and run by Hedley Edward Haynes (originally from Fairford, Gloucestershire) of the Yeovil Bacon Curing Company and the Haynes family. Almost from the beginning of its existence there are near-weekly accounts in the press of animal auctions and shows where bacon pigs were "to be removed.... to the factory of the Yeovil Bacon Curing Company for immediate slaughter". During the Great War the press reported several attempts by the Company to retain workers by seeking exemption to the draft at the Somerset Appeal Tribunal at the Shire Hall, Taunton, mostly met with success, or at least temporary exemptions. However, not all was plain sailing for the Yeovil Bacon Curing Company and in August 1922 Hedley Haynes found himself the defendant in seven summonses at Trowbridge Petty Sessions for supplying 'plucks' (the heart, liver and lights of the animal) and 'trimmings' which were seized and certified by the Medical Officer as "tuberculous and condemned". Hedley was convicted on all summonses and fined a total 0f £28 10s (around £1,400 at today's value). The Preston Bacon Factory and associated land was auctioned in October 1931 by direction of the owner Hedley Edward Haynes of the Yeovil Bacon Curing Company. The following description is taken from the sale details. "Situate in the Borough of Yeovil, adjoining the Yeovil-Ilminster main Road, about 1½ miles from the centre of the Town and Railway Stations (Southern and Great Western) together extending to an area of about 4½ acres. 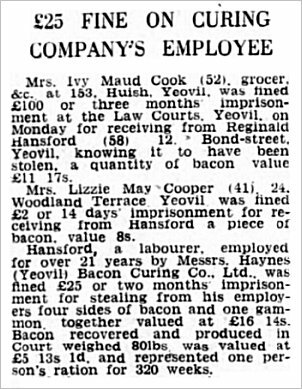 Whether or not the sale actually went through is not recorded but the Haynes family were still running the Yeovil Bacon Curing Company during and after the Second World War. 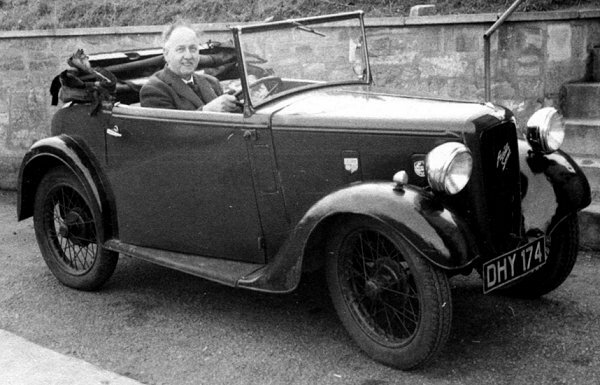 Hedley Haynes died on 14 April 1940 and his estate was valued at £19,467 5s 2d (around £3.7 million at today's value). His sons Eric and Arthur continued the company. During the Second World War, in the paddock to the immediate northeast of the factory was sited Yeovil Barrage Balloon Site No 20, "Yeovil Bacon Company" recogniseable on the aerial photograph below by the pale circular structure with a loop road. It was also during the Second World War that one of the company's employees, Reginald Hansford, who had worked at the factory for 21 years, got involved with the 'Black Market' and stole four sides of bacon and a gammon - the equivalent to one person's ration for more than six years - from his employers, selling them to a local grocer. Reg Hansford's £25 fine is the equivalent of about £3,000 at today's value. (see Gallery below). The grocer, Ivy Cook of Huish (the previous owner of Montague's corner shop), was fined £100. The Bacon Factory, together with the Post Office and houses between the factory and Preston Road, were demolished by 1963 to make way for shops and a petrol filling station with Stratford Road behind. Much of the orchards and paddock - Home Close (Parcel 100) - are now mostly the playing fields of Preston School. 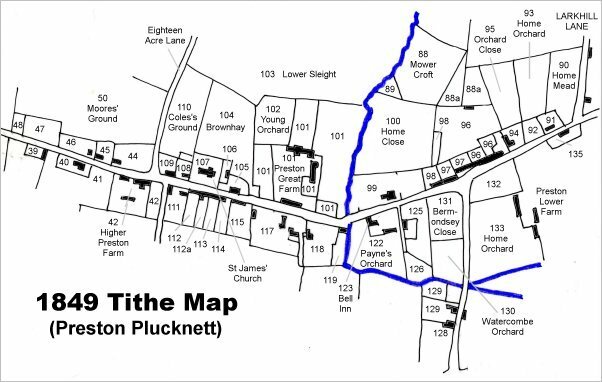 The 1849 Tithe Map of Preston Plucknett (north), showing the location of Home Close (Parcel 100), the location of the Bacon Factory right of centre. 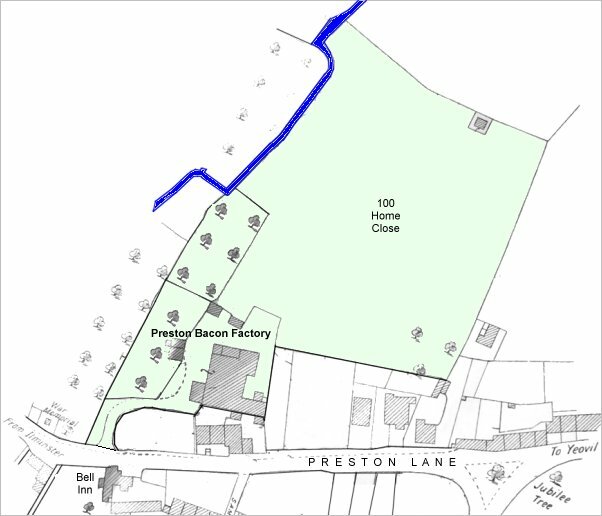 This map, based on the 1903 Ordnance Survey map, shows the Preston Bacon Factory with its associated orchards and paddock, Home Close (Parcel 100) shaded light green, now mostly the playing fields of Preston School. It had direct access to Preston Lane (today's Preston Road). A report from the 9 January 1939 edition of the Bristol Evening Post describing the failed burglary at the Preston Bacon Factory. Part of a report from the 24 April 1943 edition of the Taunton Courier outlining the 'black market' activities of Yeovilians, including a labourer of 21 years standing at the bacon factory who 'liberated' four sides of bacon and a gammon from his employers. Reg Hansford's £25 fine is the equivalent of about £3,000 at today's value. 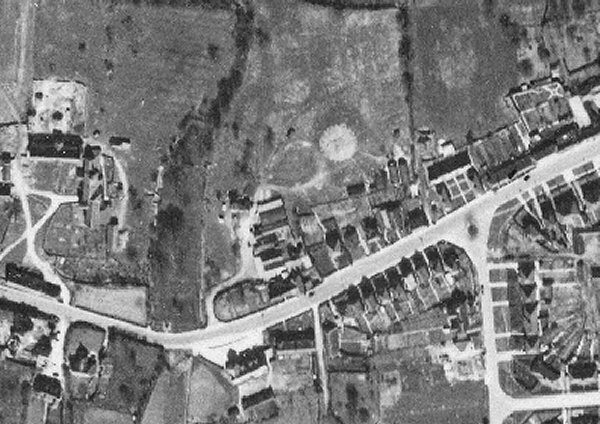 The 1946 aerial survey showing the bacon factory just lower left of centre. Also seen on this photograph, recogniseable for the pale circular structure with a loop road is Yeovil Barrage Balloon Site No 20, "Yeovil Bacon Company". As well as the circular concrete base two Nissen huts can be seen to the south east and other possibly related structures. The remains of the loop road that the winch lorry would have used can be seen to the west. Arthur Haynes, who ran the Yeovil Bacon Curing Company after the death of his father Hedley.